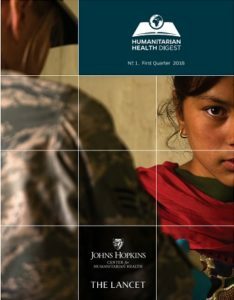 The Humanitarian Health Digest is a new quarterly bibliography of published peer-reviewed journal articles on humanitarian health. The Digest is compiled by the Johns Hopkins Center for Humanitarian Health and The Lancet. It includes one or two new commentaries on peer-reviewed articles cited in the Digest. mostly include primary research and systematic reviews. All featured articles from the Lancet family of journals will be free to read with registration on TheLancet.com. It is the Center for Humanitarian Health’s goal that other journals will follow suit to allow all peer-reviewed articles to be free to read so that humanitarian workers worldwide can learn from and apply lessons learned and conclusions immediately in the field to benefit persons affected by conflict, natural disasters and technological disasters.